This Saturday the #1 ranked Alabama Crimson Tide will take on #4 Auburn Tigers in a game fueled by historic rivalry and flavored with National Championship implications. 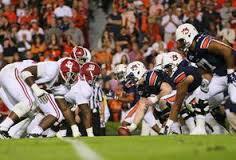 The game is known as The Iron Bowl. ESPN announced Saturday Lee Corso and the rest of their Gameday crew will be there. It’s a safe bet Corso will choose the elephant mascot. It's a safer bet, if you’re not from Alabama you’re sick of hearing about Saban, the SEC, and what the entire state has done for college football. You’re sick of Kirk Herbstreit singing the Tide’s praises. Sick of CBS game callers trying to sell viewers underdog win scenarios just to keep the blowouts interesting. But I believe the state of Alabama deserves something to brag about. Football is the one place where you can scream for someone to lose and not feel like you’re losing your salvation in the process. It’s a game about more than the shouts, the hits, the yelling, and the cursing. It’s where no one cares what color you are, the status of your financial background, or who you’re dating. (Unless you’re AJ McCarron of course.) As long as the man in the Crimson uniform grabs the ball and runs, we’ll cheer his name into the heavens. Being from a region where one is constantly poked at by the rest of the country for being too dumb, too fat, not having enough teeth, marrying a cousin, or worst of all, being racist, football is a balm to those wounds. As a TV news reporter in South Florida and Las Vegas, my UA education was something to be scoffed at, despite my college boasting one of the best Broadcast Journalism schools in the country. When my future husband introduced me to his California friends and family, one of them asked with genuine sincerity why Alabama was a Red State, considering how poor its people are. Now living in San Diego, whenever we meet someone new who learns how we met, he or she will ask my husband, “What on earth made you go to Alabama for college?” Yet they never ask what on earth made me choose to leave home and loved ones to settle down across the country. So yes, I brag about taking home the National Title in 2009, 2011, and 2012. As I proudly admit I cheered loudly for Auburn, our in-state rival, to beat Oregon down to a hot mess for the 2010 title. People outside the South may think they’re better, more educated, and more open-minded, but in our country’s favorite sport, the Crimson Tide reigns supreme again and again. Alabama is far from innocent. A stand in a schoolhouse door, public beatings by those charged to serve and protect, and the bombing of four little girls inside a church, forever gives new meaning to the words red state. Generations later, a defensiveness fills the air surrounding Birmingham difficult to describe. And nearly a decade since I called it home, I’m forced to be careful with any comparisons of my old life to my new, for fear family will look at me and say I now think I’m somehow better than they. But then I remember The Bear - Paul “Bear” Bryant, The University of Alabama’s winningest football coach - and how he took up the profound theme, "We don't have any black football players. We don't have any white football players. We have football players." And how he won. A lot. And never stood in any locker room door. And that’s also a part of Alabama history. Here's to the Iron Bowl. Roll Tide.